This dynamic new reference work is designed to appeal to educators, students, and avocational archaeologists with a desire to learn about the real world of archaeology outside the college classroom or dig site. 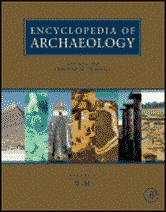 The Encyclopedia of Archaeology encompasses all aspects of archaeology, including the nature and diversity of archaeology as a discipline, the practice of archaeology, and archaeology in the everyday world. Featured are articles by leading authors that summarize archaeological knowledge at the beginning of the 21st century, highlighting important sites and issues, and tracing the development of prehistoric cultures around the globe.